I’m a BPI Express Mobile app user and enjoying the benefits of this on the go tool. Aside from feature Transfer to Anyone, you can also reload your Globe and Smart SIM account using this app without data charges. So while you’re stuck on a heavy traffic or in the middle of nowhere and thinking of reloading you phone to call or text your love ones just grab your smart phone then use the BPI Mobile app. In just a few clicks, type your mobile number and amount then that’s it. Pretty quick right? To give a little guide on how it works just read below for your reference. Prior to the steps below, I assume that you’re using this app and had a BPI online banking account. In case you haven’t downloaded the app yet just go to your mobile phone App Store (Play Store for Android users and Apps Store for Apple/iOS). From there you’ll se your Account Number, Mobile Number and Amount captions. On Amount, select available predefined denominations available on your network. (From 50-1000 pesos). Available to Globe, TM, Smart and Talk N Text. Click Reload and that’s it. 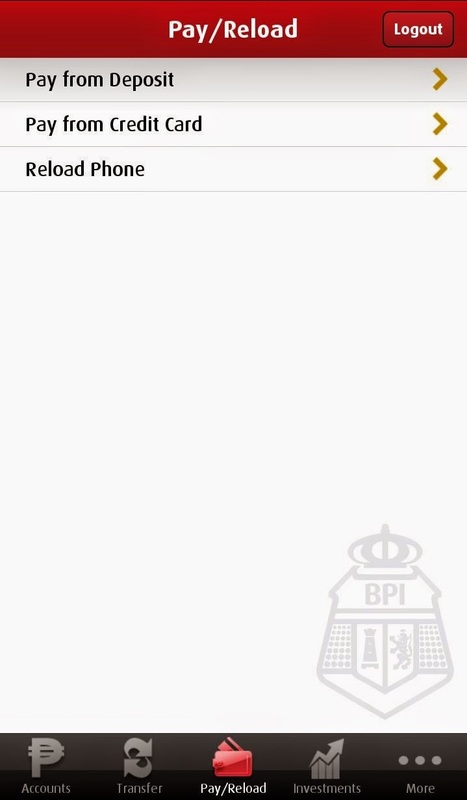 No mobile internet connection using BPI app? You don’t need to worry on using BPI Mobile app on both networks as it’s totally free to access without any data charges. All you need to do is to turn on you mobile data (packet data), select your correct prepaid APN then you’re good to transact. You can also do more with BPI app Pay/Reload tab, other options are Pay from Deposit and Pay from Credit Card where you need to enrol merchants on your account for fast and easy payment transactions. Update: You can only load Globe and TM using this app, Smart subscribers may use SIM Banking to load their prepaid number. 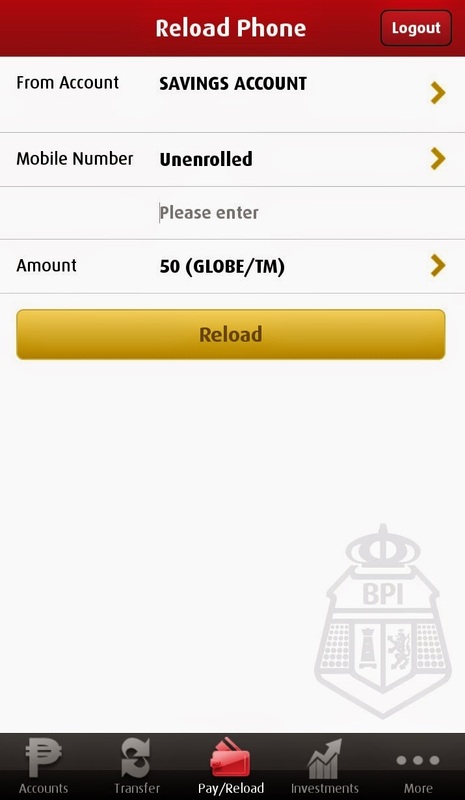 Just go to Smart Menu > Smart Money > Mobile Banking > BPI using your SIM card. I learned one good thing from this post, you can reload an unenrolled prepaid number. However, as one previous commenter said, the BPI online facility only loads Globe/TM, no Smart/TNT. I always get the ERROR 99 "System is currently undergoing maintenance" for weeks now. The amount was deducted but i didnt receive the load. What do i do? I have the same issue. What did you do about this problem? You also need to activate (if you haven't) the Transfer to Anyone feature before this will work. I will go try that later today. I think nagupdate ang BPI sa fund transfer and reloading process. The only option to enroll a prepaid mobile number is by mailing an enrollment form or going to your bank personally. I was able to transfer funds before without going to the bank or signing up a form but when I tried transferring funds to another BPI account, only option I got is to enroll the account number by signing up the form. Hassle. That is defeating the purpose of signing up online.